Add the chicken to a medium bowl. Dissolve the corn starch in the rice vinegar and tamari. Add the corn starch mixture, mix well and marinate for 2 to 3 hours. Keep refrigerated. Mix the black bean and sweet chili sauce. Keep aside. Heat a wok like saucepan with the olive oil. Add the broccolini stalks, ginger and garlic. Saute on high heat for 2 to 3 minutes. Add the minced chicken and cook while separating on high heat. Add the broccolini greens and mix well. Add the black bean sauce and mix well. Bring to a boil and cook for another 2 to 3 minutes. Check for seasonings and serve with rice or noodles. 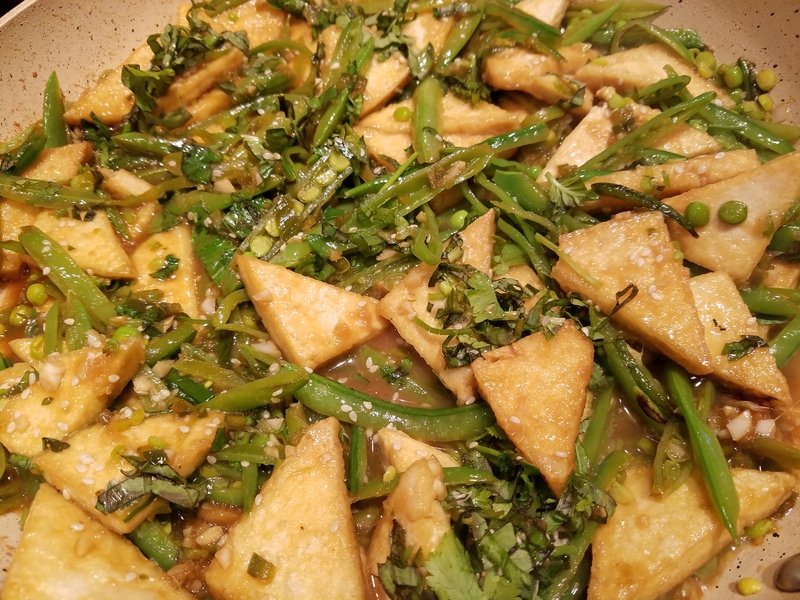 This is a great recipe to make for Meatless Mondays… I love making tofu dishes- we all love it. Recently I have been getting my inspiration from the New York Times cooking site – it has lots of really really good ideas. This recipe is from there.. I tweaked it a bit but it is still quite similar. Try this one, it is a winner! Transfer all the ingredients to small bowl, mix well and set aside. Drain tofu and wrap it with several layers of paper towel and place on a plate. Top with a heavy can and let the tofu drain for 30 minutes. Unwrap the tofu and into four parts and then diagonally. Dry with more paper towels and keep aside. Transfer the cornstarch and salt into a wide bowl. Dredge the tofu and set aside. In the meantime, heat a large skillet over high heat. Add 3 tablespoons peanut oil and start browning the tofu on each side for 2 to 3 minutes. Take out of the pan, add more peanut oil and add the sugar snap peas and scallions. Stir fry until soften- 1 to 2 minutes. Add the sauce and bring to a boil. Add the tofu and garnish with cilantro, basil and sesame seeds. Serve with brown rice. 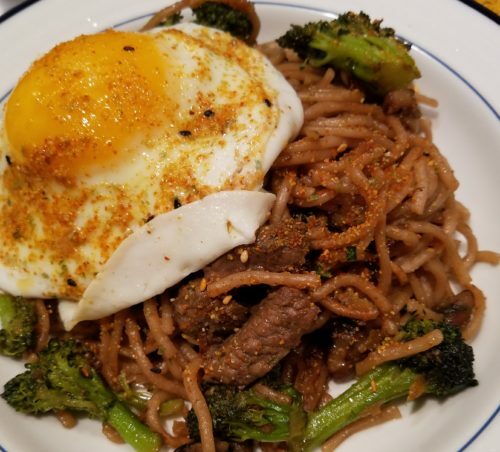 I tweaked this recipe from New York Times cooking section- it is definitely one of my favorite places to get inspired as they have such amazing variety of recipes. This one reminds me of my childhood in India ordering sweet and sour chicken from a local Chinese restaurant called Suzie Wong. Mix the cornstarch with the salt and pepper and toss the chicken pieces in the cornstarch mixture. Heat a large non-stick frying pan with the oil on high. Add half of the chicken and cook, turning occasionally until golden brown and near cooked, about 4 minutes. Repeat with the rest of the chicken and keep aside. 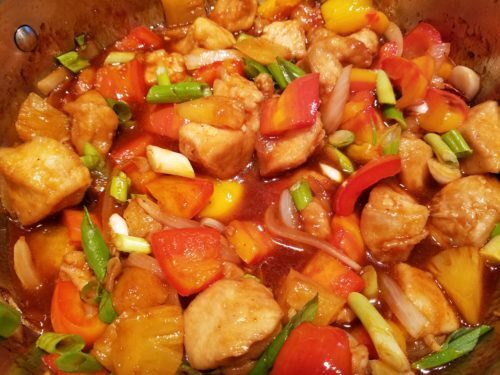 Mix the vinegar, honey, pineapple juice, ketchup, oyster sauce, soy sauce, brown sugar and garlic in a small bowl and keep aside. Add more oil to the frying pan if needed. Heat on medium heat and add the dried red chilies. Saute for 30 seconds. Add the onion and pepper and sauté on high heat for 2 minutes. Add the sauce, pineapple chunks and the chicken. Bring to a boil and let the sauce reduce on medium heat for 2 to 3 minutes, making sure the chicken is cooked through. Check for seasonings and garnish with scallions. Serve with white or brown rice. Place the florets onto a lined cookie sheet. Drizzle olive oil and tamari. Mix well and broil under a high setting until the florets are golden brown for about 10 minutes. Mix the ketchup, garlic chili sauce, tamari and hoisin sauce and keep aside. Heat a large wok like saucepan and add the olive oil. Add the onion and garlic cloves and sauté on medium high heat for 2 to 3 minutes. Add the cauliflower florets and sauté for 4 to 5 minutes. Add the sauce, mix well and cook covered on low heat for 7 to 8 minutes. Take the lid off, check for seasonings and top with cilantro. Stir together the garlic, soy sauce, honey and red pepper flakes. Heat a tablespoon of peanut oil in a wok like pan till scorching hot. Add the steak and ginger. Saute on high heat for about two minutes, sprinkle with salt and transfer to a plate. Add 2 tablespoons peanut oil into the same wok, add the mushrooms and sauté on high for 3 to 4 minutes, till the mushrooms are golden brown. Transfer to the same plate. Add the remaining tablespoon oil to the wok and add the broccoli florets. Cook on high for 2 minutes and add chicken broth to steam the broccoli. Cook for 2 minutes, add the carrots, steak, mushroom and soy sauce mixture. Bring to a boil and add the noodles and toss well. Check for seasoning and add salt accordingly. Add the sesame oil, scallions and lime juice. Toss to coat and serve warm. Mix the tamarind, marmalade, orange juice, tamari and corn starch making sure all the ingredients are dissolved well. Keep aside. Heat a wok like pan with the olive oil. Add the garlic, ginger and onion and sauté for 2 to 3 minutes on high heat. Add the white parts of the bok choy and mushrooms. Saute on high heat for 4 to 5 minutes. Add the tofu and the sauce. Mix well and bring to boil. Add the bok choy greens and cilantro. Cook for another minute. Check for seasonings and serve on brown rice. Mix the tamari, vinegar, honey and chili sauce in a small bowl. Keep aside. Mix the corn starch in broth and keep aside. Heat a large wok like saucepan with the oil. Add the sliced mushrooms on high heat and sauté for 2 to 3 minutes. Add the ginger and garlic and sauté for another 2 minutes. Add the white parts of the bok choy and sauté for 2 to 3 minutes. Add the tofu and the sauce. Bring to a boil and add the corn starch mixture. Mix well and bring to a boil. Check for seasonings and add the bok choy greens. Serve with brown rice.